Which color looks more dashing Black or Cyan...? I'm going 2 buy 1. Pls ansr...? Is there anyway that i could change my virtual keyboard, i got a huge fingers so im having a hardtime using it, what i want is alphanumeric keyboard, is that possible? This phone rocks..it's simply great!! AnonD-49722, 04 Jul 2012if you want a new experience, try n9, but if you want windows phone, wait for wp8, you will di... moreThanks a ton,then N9 it is. Which one do i buy?? 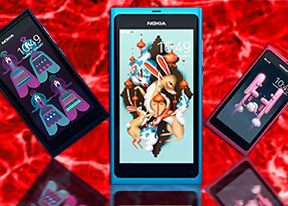 I'm highly confused between N9,Lumia 800 and 900,which one is the best?? Symbian is simple but it has everything u need. Meego is really an understated OS. I think it is one of the best OS ever developed by Nokia. It is slick and very refined. Bansi, 03 Jul 2012Same too......……where ?????? ?For new N9, ct zero nine eight 42 five 666 zero eight. but this saying Device not supported..
Hurrah..PR 1.3 is available for my N9..will download it at night..enjoy friendS ..
i got a N9 earlier this uear from Dubai. It does not recognise SIM card in Nigeria. Been in and out of Nokia care centre twice. No solution, was told maybe board issues and very expensive to fix. Any help please?